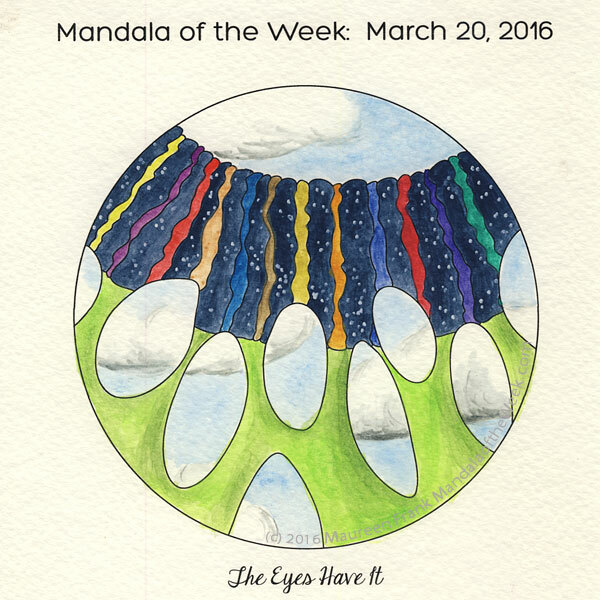 I present my coloring/painting of this week’s Mandala of the Week: The Eyes Have It (from Sunday’s MotD post). Just before painting this week’s MotW/MotD, I meditated for how best to represent this mandala today. In my head, I thought the ovoids would be like brightly painted eggs (could have something to do with it being Easter this coming Sunday). Instead, in my mind’s eye I saw them as openings to a partly clouding sky, like portals. I saw the wider vertical stripes being painted the same indigo blue with stars added after the fact. With the thinner vertical stripes I saw different colors with the base section being bright spring green. In the end it appears as a mild form of optical illusion. We can focus on the sky and the ‘ovoids’ become windows. We can focus on the green field, and the vertical lines appear to be a big wall blocking the ovoids from advancing. It’s interesting to me that clouds appeared as part of this mandala. They are one of nature’s most fascinating optical illusions. Stare at them long enough and they appear to form into different shapes, creatures, people, objects, or places. Allow our minds to wander, to daydream. Connect with our imaginations, let our Creative Spirit soar among the clouds.